When on the campaign trail this past year, then Senator Barack Obama was often asked about his taste in music. Without fail, Obama would answer that Aretha Franklin was his favorite singer. Apropos choice for a candidate who, perhaps managed political risk, better than any candidate in modern history. Indeed you’d be hard pressed to find any music lover over the age of 30 who would profess anything but affection for the woman who has been, for more than 40 years, simply known as “The Queen of Soul.” President Obama’s choice of Aretha Franklin to sing “My Country ‘Tis of Thee” at his inauguration, was an informal acknowledgment of what we’ve all known; Franklin is simply a national treasure. In celebration of Aretha Franklin’s life and career, on this her 67th birthday, I’d like to offer a playlist of great Aretha Franklin performances. And while there are literally dozens of “best of” collections that put Franklin’s career in proper perspective, I’d like to offer performances that can’t regularly be heard on your local oldies station. Franklin’s A Tribute to Dinah Washington, was a public nod to the legacy of one of her most important influences (the other being gospel singer Clara Ward). Recorded when Franklin was still wallowing on the Columbia label, where the legendary John Hammond had signed her, “This Bitter Earth” may be the best inkling of the genius that was to come. Only 22-years old when she recorded this Dinah Washington classic, it was clear that Franklin was someone who had a grasp of many disparate popular forms, as well as the Gospel tradition. With jazz guitarist Kenny Burrell in tow and Ms. Franklin herself on piano, “Trouble in Mind” is rollicking gutbucket rendition of a 1926 Blues classic, written by Richard M. Jones and initially performed by Bertha “Chippie” Hill, with Louis Armstrong accompanying on cornet. The song highlights the spiritual component of the blues (I’m goin’ down to the river/I’m gonna take my old rockin' chair/Oh and if those blues overtake me/I’m gonna rock on away from here), which made it a perfect choice for Franklin, who finessed the line between Gospel and Blues better that anyone since the father of gospel Thomas Dorsey. 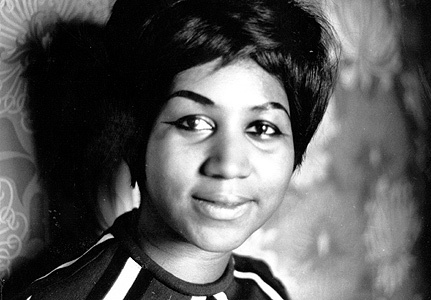 “Take a Look” was the title track of Franklin’s final studio recording for Columbia, released as she was walking into Fame Studios in Muscle Shoals to record her Atlantic debut. Written by famed songwriter Johnny Otis , who produced Dinah Washington’s recording of “This Bitter Earth,” the song highlights all the missed opportunities that the label had to really make Franklin a major star. With the Civil Rights Movement as a backdrop, “Take a Took” is an earnest call for peace and tolerance, just as Franklin herself would play a more public role in the struggle for Civil Rights. By the time that Franklin’s Soul ’69 was released, she was already at the center of a seismic shift in popular music, which established her as a major crossover pop star and making her, arguably, the most popular black woman performer ever. On the strength of groundbreaking releases such as I Have Never Love a Man (1967), Aretha Arrives (1967), Lady Soul (1968) and Aretha Now (1968), Franklin could afford to look back and pay tribute. Covering a range of pop and blues classics including Percy Mayfield’s “River’s Invitation” and childhood friend Smokey Robinson’s “Tracks of My Tears,” the clear highlight is Franklin’s rendition of “So Long.” Simply put the song ranks as one of Franklin’s most exquisite performances ever. By 1970, even Ms. Franklin was feeling the push of changing tastes, eventually adapting with the toe-tapper “Rock Steady.” In the meantime she held her own doing the music that she wanted to do. In the larger scheme of things, The Girl’s in Love with You (1970) is easily lost among her more visible outings, but it is arguably one of her finest recordings. Though the sublime “Call Me” and “Son of a Preacher Man” (a tossup between Ms. Aretha and Ms. Dusty, me thinks) are the more well known tracks on the album, which also included two Lennon and McCartney songs, “It Ain’t Fair” and ‘Share Your Love with Me” are examples of an artist who is just on the cusp of being in full control of her artistic capacity. In February of 1971, Ms. Franklin headed to the Bay Area to do three nights at the famed Filmore West, with saxophonist King Curtis serving as opening act and musical director. The dates were an opportunity for Franklin to reach out to the counter-culture that coalesced in the region. Nearly 40 years later, the performance stands one of the greatest moments in the careers of both artists, if not one of the great live recordings in all of pop music. The late great Billy Preston and noted session guitarist Cornell Dupree were among the band members that night. One of the early efforts of Kenny Gamble and Huff and recorded by Franklin just as the duo were establishing Philadelphia International Records, “A Brand New Me” highlights her Jazz sensibilities. Her piano solo midway, is worth the price of admission. “Oh Baby” is a true obscurity from Franklin’s career. Tucked away on her largely forgettable 1974 recording Let Me In Your Life, which included her retread of Stevie Wonder’s “Until You Come Back to Me” (which many forget he originally recorded), “Oh Baby” is the portrait of an artist at the peak of her powers. A sweet song in its own right and one that Franklin penned herself, the tonal colors and pitch of her performance are simply amazing, especially during the final minute of the song. At age 32, Franklin could have retired and her legacy would still remain intact. After a string of success with Clive Davis and the Arista machine in the 1980s (at least until Ms. Whitney capture Mr. Davis’s attention), Franklin was ”re-introduced” in 1998 courtesy of a production collaboration with Lauryn Hill. A savvy commercial move, “A Rose is Still a Rose” was Franklin’s last “hit.” A year later Franklin, against all acceptable logic at the time, went in the studio with Mary J. Blige to record “Don’t Waste Your Time.” The song appeared on Mary (1999), which is in my mind, Blige’s career defining recording. Though Blige has never possessed Franklin’s technical skills, they very much share a relationship as the emotional centers of their respective generations. Mark Anthony Neal is the author of several books and a Professor of Black Popular Culture in the Department of African and African American Studies at Duke University. A frequent commentator for America’s National Public Radio’s News and Notes with Farai Chideya, Neal also contributes to several on-line media outlets, including NewsOne.com. Neal’s blog “Critical Noir” appears at Vibe Magazine.